A total of 16 activists are already working on the 3C Cultivate Climate and Community project of Tordera, in the province of Barcelona. 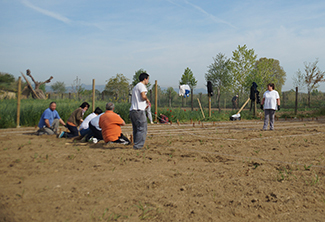 Today, after the meeting of contact, they are working alongside technical Humana staking beds or plots. They have been selected in collaboration with the Foundation and the area of social services of the City. This initiative seeks to promote urban agriculture respecting our environment through organic farming, obtaining products for own consumption; it also involves people wanting to strengthen ties with other members of their community. Today there are 90 activists belonging to the five 3C active projects: 36 in Cornella de Llobregat, 11 in Lliçà d'Amunt, 16 in Tordera (the three municipalities in the province of Barcelona), 12 in Leganes and 15 in San Agustin de los Reyes (Madrid).